Our new pin keep and scissors fob set can be finished using our detailed finishing instructions or frame it in a standard size photo frame and add it to your display of family photos. Stitched on 30 count Pearl Legacy linen using Needlepoint and Dinky Dyes silk and embellished with specialty stitches and two tiny cream buttons. Complete kit contains everything you need to stitch pin keep and fob. Finishing supplies not included in kit. Stitched on 32 count Porcelain Pink Legacy linen using Needlepoint and Dinky Dyes silk and embellished with a tiny gold heartlet charm. Kit contains everything you need to stitch the design. Chart Pack contains chart and gold heartlet charm. Stitched on 34 count White Dower Quality Legacy linen using Needlepoint and Dinky Dyes silk, embellished with a 4mm burgundy button. Nine specialty stitch hearts to work as one large piece or use them individually to make pin cushions, scissors fobs or a heart cube. Any way you finish it, each heart is a fun and challenging to stitch. Worked on 30 count Pearl Legacy linen using pastel Needlepoint Silks and embellished with a tiny cream button. 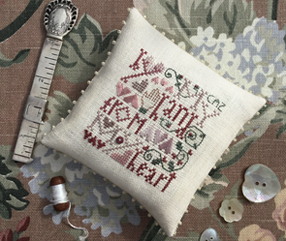 Pattern includes charts and detailed stitch diagrams for making each of the nine hearts: Elongated Cross Stitch Heart, Pulled Satin Stitch Heart, Florentine Heart, Web Stitch Heart, Blackwork Heart, Couched Heart, Hungarian Stitch Heart, Ridge Stitch Heart and Twill Stitch Heart. 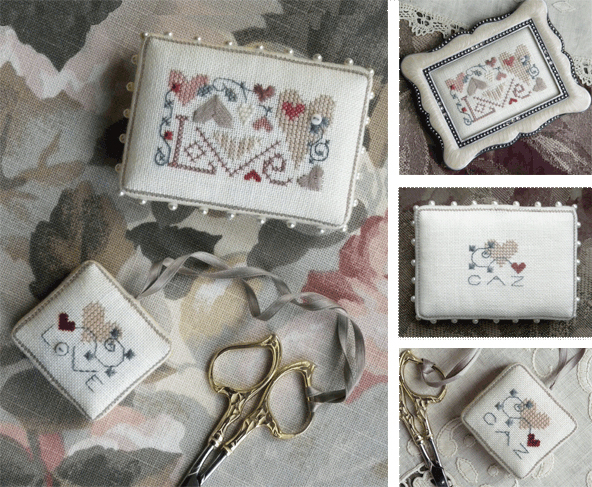 Complete kit contains Pattern, Needlepoint Silk, linen and 4mm cream button. On 30 count Porcelain Pink Legacy linen using Dinky Dyes, Needlepoint and Northern Lights Silk. Embellished with crystal hearts and beads. Chart includes detailed stitch diagrams for 21 different specialty stitches and a personalization alphabet. Complete kit includes chart, Legacy linen, Needlepoint, Northern Lights and Dinky Dyes silks and all embellishments. On 34 Count Cafe Au Lait Legacy linen using Needlepoint Silk. Chart includes detailed stitch diagrams for specialty stitches. Complete kit includes chart, linen and silk threads. On 36 Count Cream Edinburgh Linen using Needlepoint and Northern Lights silk. Embellished with a tiny (4mm) red button. Chart includes complete finishing instructions. Kit includes chart, linen, silk, button and silk satin ribbon. On 28 count Cream Cashel linen using Needlepoint and Northern Lights Silk. Embellished with buttons and ribbons. Kit comes in a pink organza gift bag and includes chart and everything needed to stitch and finish the pocket. Scissors sold separately. Special price kit available only on complete kit purchased before March 1, 2013. Supplies limited at special price. 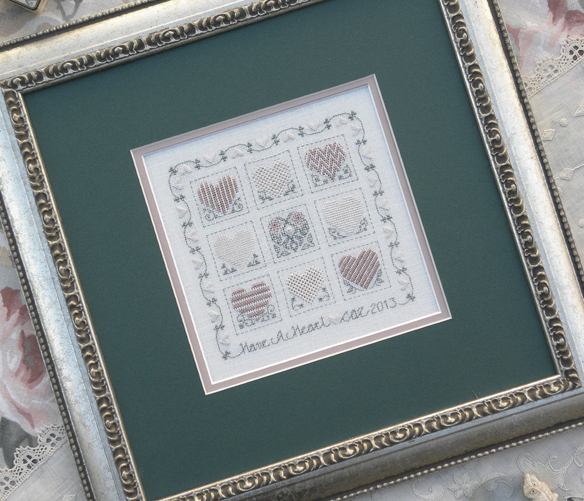 On 32 Count Antique Ivory Belfast Linen using Needlepoint Silk. Embellished with a gold heart charm. 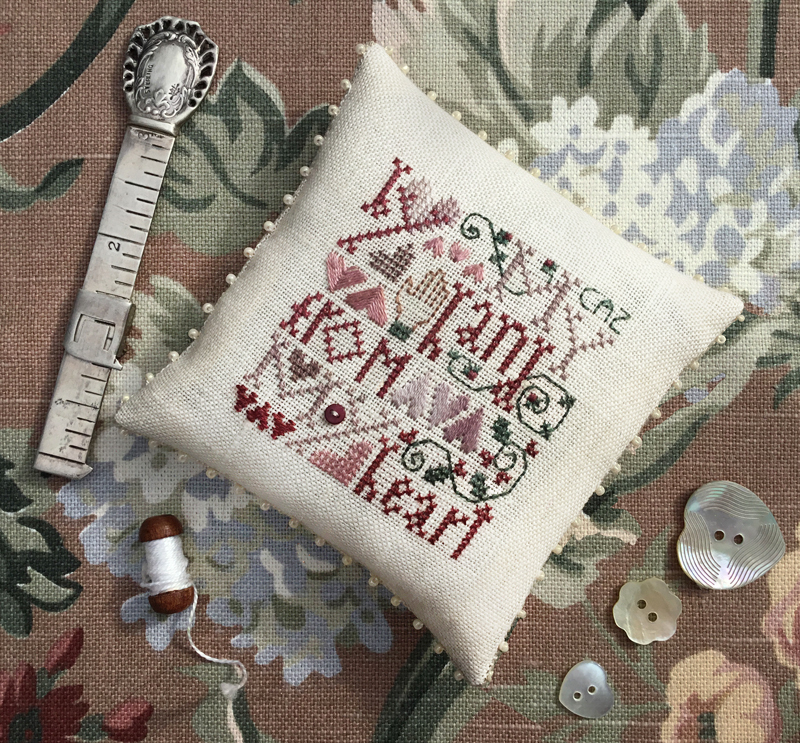 Kit contains chart, linen, silk thread and heart charm. 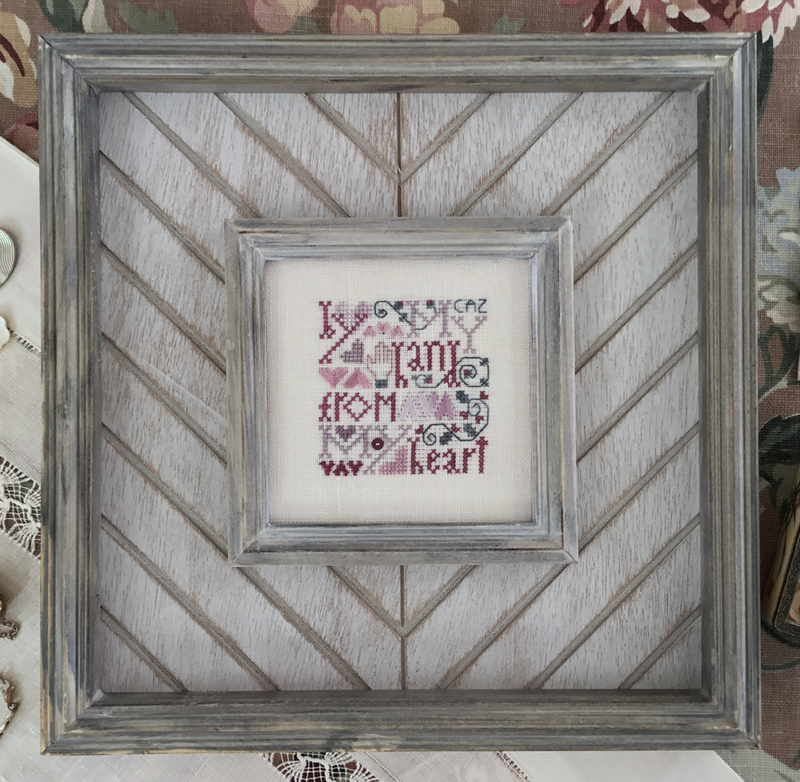 Stitched on 32 count Antique Ivory Belfast linen using Needlepoint and Dinky Dyes silk and embellished with a tiny lavender button and pink jade heart. Lots of specialty stitch hearts to hold your interestand challenge your stitching skills. Kit contains everything you need to stitch the design. Chart Pack contains chart, button and pink jade heart. 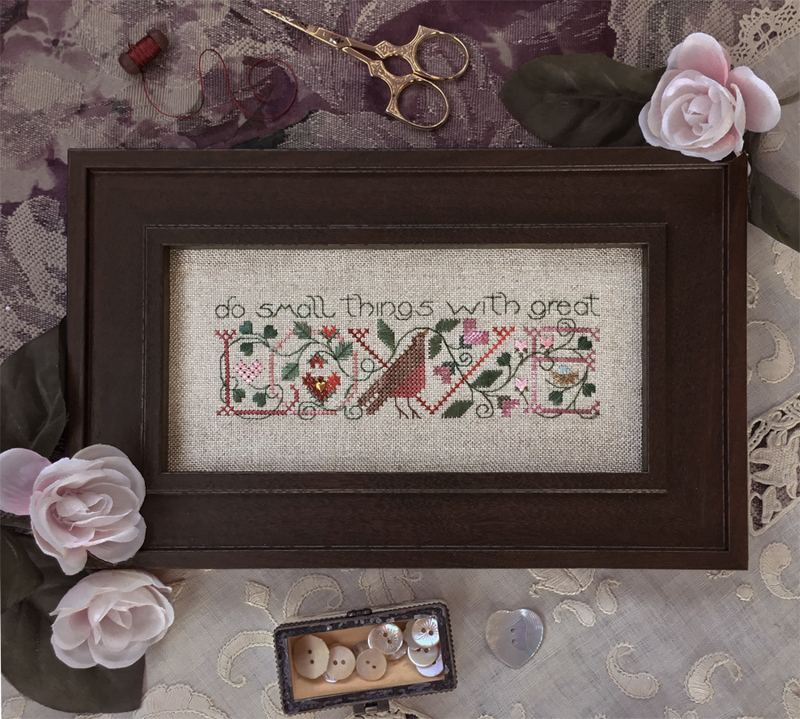 It's the little things in life, the small things done with great love ... stitched on 30 count Sunflower Seed Legacy linen using Dinky Dyes silks. Chart Pack includes chart and small heart charm. Kit includes chart, linen, silks and heart charm.on 34 count White Dower Quality Legacy linen using Needlepoint and Dinky Dyes silk, embellished with a 4mm burgundy button.